Chino House Australia’s range of bathrobe fabrics includes a variety of grades from our ultra Premium warp knitted toweling, conventional premium toweling, budget toweling, Waffle Weave. Chino House Australia also make Printed Yukata’s and jacquard robes on request. All Chino House Australia’s robes and even the budget products are pre-washed and tumble dried at the factory so the size we deliver is exactly to specification and you can expect absolutely no further shrinkage at all. All our robes can be computer embroidered with your logo either in Australia or in China depending on the urgency and the final destination. Minimums are negligible. Please see styling options page for details. 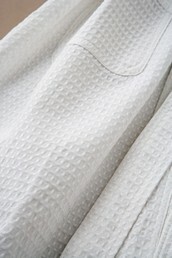 The Federaton robe is 100% cotton 1/21s ultra premium grade. This is the same as we use on our best towel but its conventionally woven not warp knitted. The Cotton Comfort waffle weave robes are 60% cotton 40% polyester so unlike pure cotton waffle weave the shinkage is virtually non existant. Ironing or stretching back to shape after drying is not required.